Kyle Busch and Stewart Friesen lead the field to green. 30 laps in stage 1, 30 more in stage 2 and the final stage will feature a 74 lap run to the end. 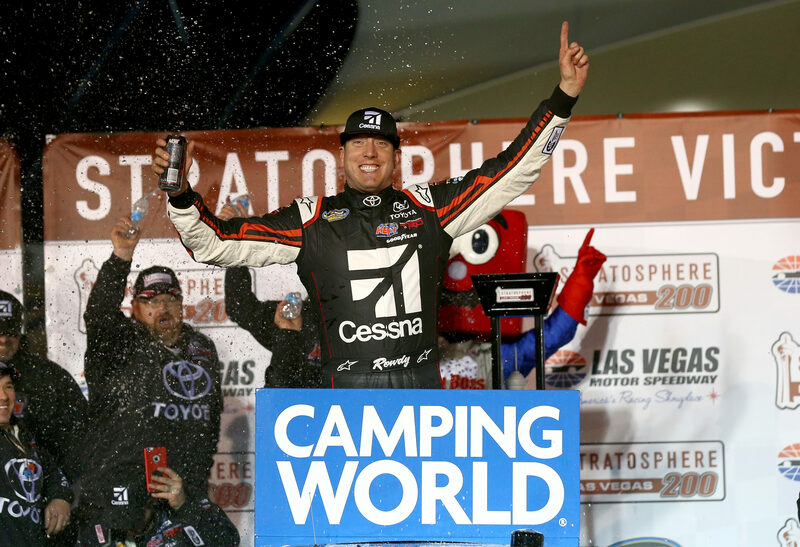 134 laps around the 1.5-mile of Las Vegas Motor Speedway. Matt Crafton is sent to the rear due to unapproved adjustments. He felt something off in qualifying. They hooked up the computer to try and find something, they didn’t. Green, Friensen leads on the bottom into turn 1. Kyle Busch hangs tough on the outside. 3 wide for 6th on back. Sauter pokes under Friesen down the back, 3 wide for the lead. Kyle Busch prevails. Lap 15, Justin Marks is cruising down the pit lane with all 4 flat. Marks spun off turn 4, no contact with anything. Kyle Busch and others hit the pit lane. He can make it to the end of the stage 2 from here. Friesen remains on track. Green, Gragson to the lead! Nemechek makes contact, he’s got big damage and flat tires, no caution. The flat caused the contact in turn 1. It was flat from the get go and the truck didn’t turn into turn 1. Kyle Busch is flying through the field! 4 feel goods and a major talent behind the wheel. He’s picking them off two at a time. The field hits pit road. Trouble! Matt Crafton doesn’t stop. He’s lost his brakes. Crafton heads to the garage area with a mechanical failure. Enfinger leads off pit road, he took two tires. Kyle Busch comes off 2nd, he also took just 2 tires. Green, Enfinger and Busch run door to door. Even for 2 solid laps with 4 fresh tires stacking up behind the both of them. Davis looks to the outside of Enfinger. Enfinger drifts up the banking to block, Kyle Busch pulls to the lead. Lap 4, Enfinger is mounting a charge for the lead. He’s moved to the bottom, he’s there. Kyle Busch and Enfinger even into turn 1. Aggressive side drafts through the tri-oval. 3 laps later, they’re still side by side. Lap 13, as the leads run side by side, Friesen has a run. At the last second, Friesen carries his momentum to a gap on the inside, 3 wide! Enfinger was already turning into the corner, he backed off at the last second. They split Enfinger, he has lost a ton of spots as he lifts off the throttle. 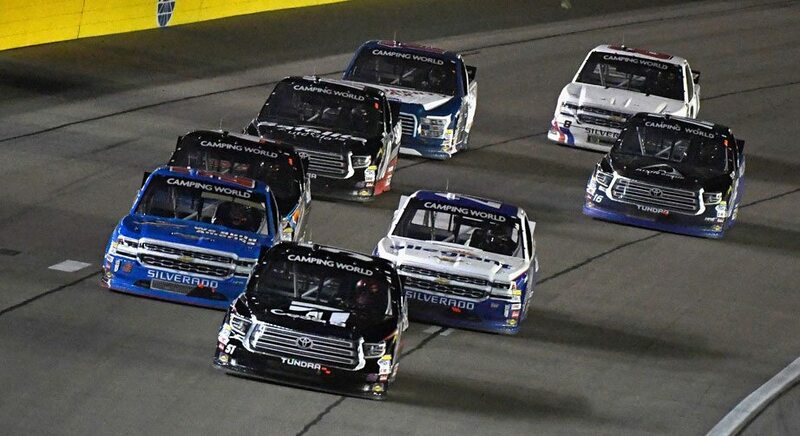 5 to go in stage 2, Friesen leads Kyle Busch by 0.2 seconds. These two have checked out from 3rd on back. Busch is there, he’s looking for the lead. At the same time, Myatt Snider is chasing down the both of them. Snider clicks 2nd away from Busch on the final lap. Johnny Sauter is +6 off pit road! He took 4 tires. Kyle Busch is in 3rd and out 6th. Stewart Friesen is in first and out first. Green, Friesen leads into turn 1. Brett Moffitt pulls to his bumper. They’re 3 and 4 wide down the back for 4th on back, no contact. Lap 69, 3 wide for the lead! Kyle Busch pulls all the way to the apron down the back, avoiding a side draft. Moffitt and Busch cycle through Freisen who falls through the middle. Busch prevails but they’re stacked up behind him. Lap 72, 4 wide into turn 1. Justin Haley was already turning to the bottom when Enfinger through it in on the bottom. Haley was the 3rd car from the bottom, he didn’t know they were 4 wide. It could have been worse but Haley backed it into the fence. Green, Kyle Busch leads with Moffitt glued to his bumper into turn 1. Moffit looks to the inside in turn 3, Kyle Busch lifts and gives it to him. Lap 33, Myatt Snider hits the pit lane. He’s the first truck to pit under green. However, he’s been handed a penalty, uncontrolled tire. 25 to go, trouble for the leader! He was looking for a hole around the lapper of Michel Disdier. He’s from Nice, France and the driver is making his first NASCAR start. Disdier was side by side with another car already. Moffitt looked 3 wide to inside, he got ran to the apron. He makes contact with the lapper. They both continue but Kyle Busch retakes the lead. Moffitt hits the pits. Gragson takes fuel only. 20 to go, Kyle Busch hits the pit lane from the lead. 16 to go, Fontaine and Sargeant are the only ones who haven’t hit the pits. Sargeant to the pits. 15 to go, the caution is out! Michel Disdier spun in turn 3. Fontaine was the only truck that didn’t pit. 12 cars are on the lead lap. 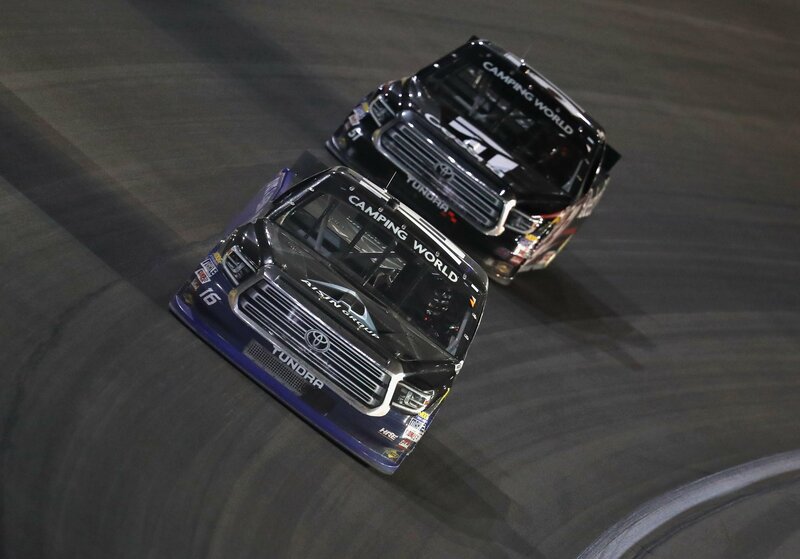 11 laps to go, Kyle Busch and Noah Gragson will lead them to the shootout. Green, Busch leads by two into turn 1. The field sweeps by Gragson, 4 wide for 2nd on back. Friesen and Moffitt run side by side for 2nd off turn 4. Moffitt wins the battle and chases down Kyle Busch. In the short run, Moffitt clearly has the better truck. or, he’s just not as experienced to save his tires as the leader Kyle Busch. They run nose to tail for the lead. Sauter and Enfinger tag alone, 4 car train at the front. Sauter is around Moffitt. Enfinger is looking for 3rd from Moffitt. 2 to go, now Johnny Sauter has pulled to the rear bumper of Kyle Busch. Sauter to the middle in turn 1, Kyle Busch to the bottom. Sauter has a run off turn 2, Busch blocks. 1 to go, Kyle Busch takes it to the apron to break the draft through the tri-oval. Moffitt has a run on Sauter. The race and brings fenders for 2nd. Kyle Busch wins by 3 car lengths! That was Daytona in Las Vegas! 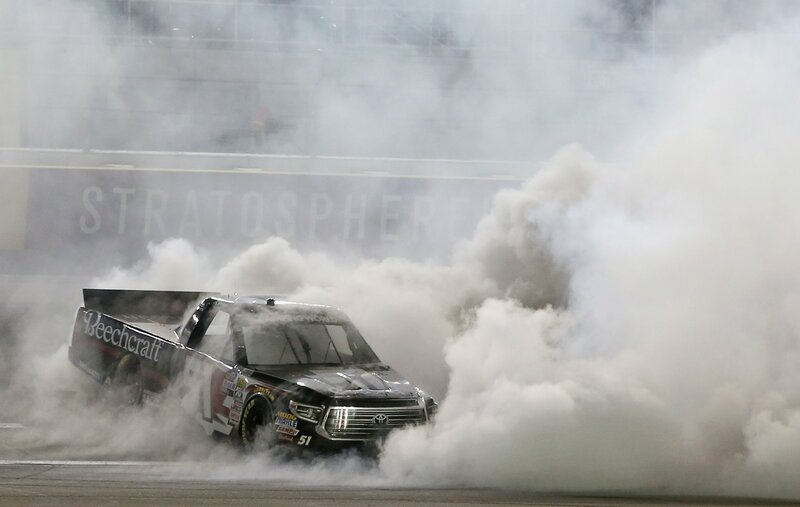 View full NASCAR Truck Series results below.